I tend to forget how good The Prince of Egypt is. One of the things I like best about it is how it conveys a sense of scale. The monuments of Egypt are big. The crowds of Hebrew slaves are big. The Red Sea is big, and it’s a big event when God parts it. But without modern animation technology, how would you have conveyed the magnitude of the Exodus? If you were anything like the author of Psalm 114, you would have written a song. You’d have had quite a challenge before you. Sounds in the air, ink on a page, or etchings in clay are so unlike the events they aim to describe, so how would you evoke, in the minds of your hearers, an event you’d never seen before? You’d write: “The sea looked and fled” (114:3). And you’d use music to deliver the weight of the image. Poking around online, it appears that this psalm may be one whose original music might be rediscovered or reconstructed–but I can’t speak with any authority to that. I was about to write that we, as modern English readers, run the risk of missing something when we read this Psalm. But then I thought about it: when we read the English words on the page, the way that most of us approach the psalm, we experience them without music of any sort, and without the poetry of the original language. We run into the problems inherent in translation: how do you preserve both the meaning of the words and their particular phonetic/orthographic character? 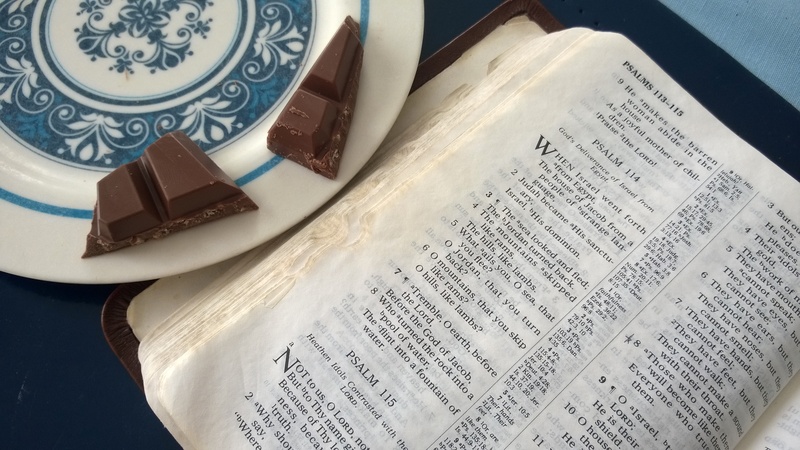 Forget running the risk–we necessarily miss something when we read this Psalm! And what am I left with, separated in time and space from the gravity of God’s intervention in Israel’s history? How can I hope to understand the God whose sea-parting power I’ve never experienced? What can I do but pray to the God who broke through the Red Sea and hope that He’ll break through the psalm itself? We’ve got a new chocolate bar today, contributed by Jenny Cook of Life in the Cookie Jar. 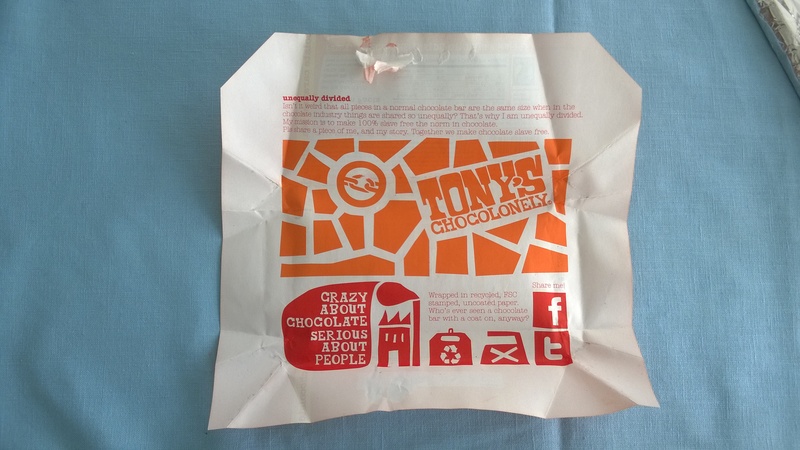 I’d never heard of Tony’s Chocolonely before, but I dig their ethos right off the bat: they broadcast loud and clear that they’re committed to slavery-free chocolate and paying cocoa farmers a fair price for their goods. Just look at the inside of the bar wrapper! Now that’s a message I can get behind, fam. Thanks again to Jenny for the new bar, and thanks to Tony’s Chocolonely for their commitment to chocolate that’s delicious and equitable! More on Tony’s in Monday’s post–and in the meantime, have a good weekend. Posted in Daily Reading, Old Testament, Psalms.Tagged bible, christianity, God, Hebrew, history, miracles, music, Psalms, scripture, translation. “The Prince of Egypt” is a good movie, and I think Stephen Schwartz’s score is absolutely key to its success. Have you ever seen the play “Godspell,” I wonder? It’s one of his earlier musicals and I have a deep and abiding love for it. Basically a musical setting (although certainly freewheeling and taking some serious theological licenses) of the gospel of Matthew. If it ever comes to a community theater near you, I urge you to go. It’s fairly popular still in the local theatre circuit because it’s small budget, small cast, can be played with just a piano instead of a full pit orchestra, and well-suited to adaptation. There’s also a movie of it from the 70s which is charmingly dated. Anyway, I think it’s worth a watch just for its religious-cultural value. Glad you liked Tony Chocolonely’s mission. It’s pretty rad. I can’t remember, but I think I found it at our local Fred Meyer, which is a Kroger affiliate, so maybe it could be at a Kroger near you? The duet on “When You Believe” never fails to get me. It’s incredible how potent the experience of music can be. Anyway, thanks for the recommendation. I can’t remember whether I’ve seen Godspell or Jesus Christ Superstar, though I suspect I’ve never seen either or I’d remember it. Godspell sounds interesting, though. I pay absolutely no attention to local theater of any sort, probably to my detriment–I watched some Shakespeare back in like 2012, and can’t recall watching any theatrical productions after that–but perhaps I could be troubled to get my hands on the Godspell movie.